The Elephone is getting ready to introduce the A7, which has a perforated camera setup placed in the top – middle of the screen. Elephone also joined the smartphone manufacturers who are preparing different projects to add the front camera of the smartphone. The company is ready to appear with the Elephone A7, adding the front camera to the center of the phone. Although it is similar to the drop notched phones, the Elephone A7, which has a significant difference because of its presence in the screen, seems to have a place in the international market, especially in China. 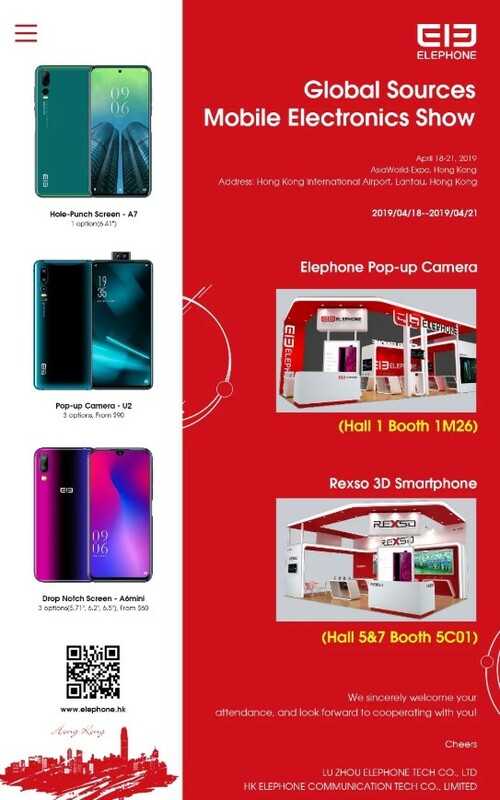 The posters of the smartphone, which are expected to be introduced at the Global Sources Mobile Electronics Exhibition to be held on April 18-21, were shared in advance. It is expected to introduce 3 different models and will introduce the A7 with a drop screen, the A6 mini with drop notch, and the U2 with a double front camera. Although the design of the Elephone A7 is almost certain, some unknowns remain in hardware maintenance. The smartphone is expected to use a Qualcomm Snapdragon 855 chipset according to unclear sources. Chinese companies, such as the Elephone, which are alternative to companies such as Huawei, Xiaomi, Oppo, help the smartphone industry to be shaped. We look forward to seeing more smartphone companies in the future.